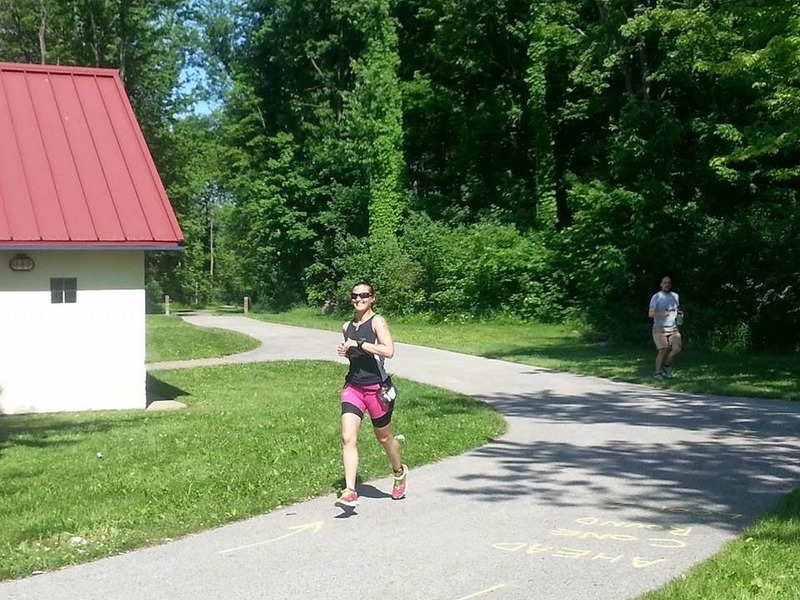 As soon as I ran out of transition, I went over to the aid station and grabbed a cup of water. I told the volunteers that I was just going to dump it on myself because I smelled really bad. Then I was off and running. Rob cheered me on as I went by (I told him he probably wouldn't want to hug me after since I had peed on my bike) and I started my first loop of the two loop course. Originally the run course was supposed to be a single out and back but there were some pavement issues on the road so they cut it short and made it a two loop out and back style course. I wasn't too happy about that, but it meant that I could see Mike on the course more. I started out way too fast, like I always do, and I kept telling myself to slow the eff down. I even contemplated walking to slow myself but I didn't want to walk, because I knew once I did that it would be hard to not fall back on walking. About a mile into my run, I saw Mike! He looked really strong and we high-fived as we ran by each other (as always I was jealous he had less to go than I did). My first mile was 8:40 pace and I really forced myself to slow down after that. It was getting hot but I still felt really good and I hadn't walked yet. Unlike the bike course, I saw more people on the run course including some of the duathlon participants. 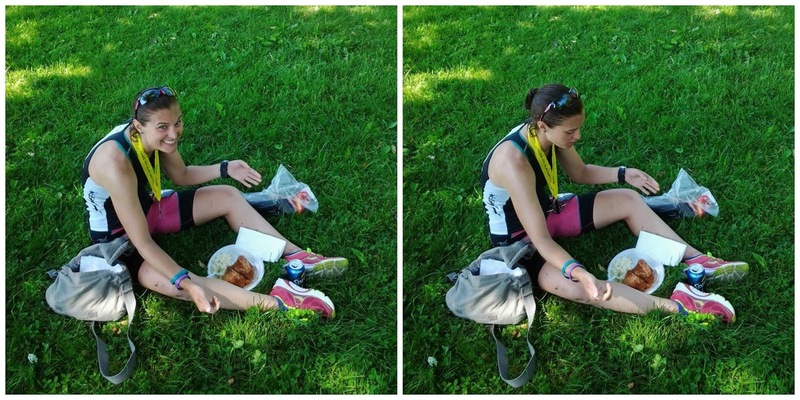 I made it through the first aid station without walking, took some water, and went on my way. I really wanted to make it to the first turn around before walking, but that didn't happen. I did go almost 3 miles without walking, though. The course went through the park, past a marina, near another park (where a wedding was taking place, I felt bad that all of us sweaty triathletes were running by) and then through the town of Geneva-on-the-Lake before we went through another park and eventually made it to the turn around point. I was doing my usual thing of taking water, drinking some and dumping the rest of myself to try to cool down. While running through the town, I was really hot and walked a bit. I was still keeping up a good pace, a little slower than I would have liked but I was still happy with it. The town was a bit congested with tourists and I should have run on the road (like Mike did) instead of on the sidewalks (like the race director said that he preferred we did). I hadn't seen the other female triathlete yet and I wondered if she had dropped (later I realized that she was probably on the other side of the buildings so I couldn't see her). When I got to the turn around, there was a police officer there (who looked like he was 12) and I said, "I would rather be doing what you're doing". I don't think he liked my joke. As I ran down the one hill and walked up the other, I made it around the bend and I saw Mike! He was still running strong, he cheered me on and I kept going on my way. When I got to the next aid station, I got some water from Bob (the race director) and I said to him, "why did you make it so hot out?" He laughed as I went along my way. I was still keeping decent paces through the first loop and I just tried not to walk too much. If I noticed that my pace was slowing, I would start running to bring it to a faster pace. I started to think that Mike might catch me, since he had looked really strong, as I made my way to one of the final aid stations before the turn around to start the second loop. I told the volunteer I would see him soon and I kept going on my way. As I was going through the park toward the marina, I saw Barb, the other female triathlete, and she said it was hot out and I agreed! After crossing over a bridge near the marina, I could see Rob in the distance! I told him that I wasn't feeling the greatest but I kept on going to the turn around. I grabbed some water and when I ran by him on my way back out, I told him that I expected a better effort from him next weekend (he's racing). He said that it was just a training run and then I was all alone again. I thought I would see Mike right around the same point that I had on my way out, but I didn't. I started to get a little nervous when I still hadn't seen him and then right around 1 mile out from the finish I could see him in the distance. He was bent over massaging his calf, and I knew that the heat/distance/lack of salt had gotten to him. I yelled to him, "walk it off!" and ran up to him. As he tried to walk, he bent over again in pain to massage it and I slowed to a walk and asked if he was alright. He said he would be fine, I was still worried but knew he could crawl a mile if he had to, and he told me I was doing great and I left him. I had stopped taking nutrition at this point, my stomach was not doing well and I didn't think I could handle it. I went through one more aid station and took some water. I had slowed down to about 12 minute pace, but I was alright with that. As long as I never got above that I knew I could finish with a respectable time. I ran by the wedding again, and said congratulations as they were taking photos, and then ran through the other park. As I got to the town, I took some flat Coke (it was really warm) and some water. I hoped that the Coke would help and I think it did. Running through the town was interesting, there were people who were interested in what we were doing and would cheer us on or give us thumbs up and then other people were completely oblivious as to what we were doing (a few people said, "oh she's a track runner" as I would run by). As I got to one of the aid stations, that had two on either side of the street, the volunteer apologized for not being on the right side of the road. I said it was ok and grabbed some more Coke and water. At this point I was somewhat near another triathlete and he told me we could do it. I got to the final turn around, said to the cop that I wouldn't see him again (this time he laughed at my joke), ran down the hill, walked up the hill and made my way toward the finish. I told myself to just get to 12 miles and then I would only have 3 more to go. I was alternating between running and walking a lot. I was a little disappointed in myself, I hadn't completely fallen apart but I would have liked to run more to be honest. This was our first 15 mile run of the training cycle, before this our longest run had been 14 miles, so I couldn't be too upset. I am hoping with more long runs and more bike/run bricks that I can hopefully run more during the Ironman. Since I dumped so much water on myself, I probably looked like a drowned rat, I was able to squeeze my ponytail out on my neck to help keep me cool. As the final miles ticked by, I just tried to run as much as possible. I would be in a shaded area and make myself run because it was cool, I would tell myself to get to a mailbox and then force myself to get to a mailbox even further away and kept going like that. With about 3 miles left, I passed another triathlete and we both said encouraging words to each other. I finally got to the final aid station and the volunteer said, "the last mile, you must be psyched!" I said that I was, drank some more Coke and water and kept going. As I got to the park, two people biking asked me how far I had gone and I said, "almost 100 miles". They told me to keep going and I ran/walked through the marina. I got to the final bridge and as I rounded the corner I could see Rob! I was so happy because I knew that meant I was almost done. I took a few walking steps and then forced myself to run the rest of the way, as I passed Rob I said, "I don't want to be moving anymore" and he told me that I almost didn't have to be anymore. Smiling because I am so close to the end! I rounded one more bend and there was Mike, with a medal around his neck! He cheered me on and so did the other finishers and I turned toward the finish! Bob took a picture as I crossed the finish line, congratulated me and Ken gave me my medal! (I barely remember this happening but Mike took off my timing chip to give it back to them). 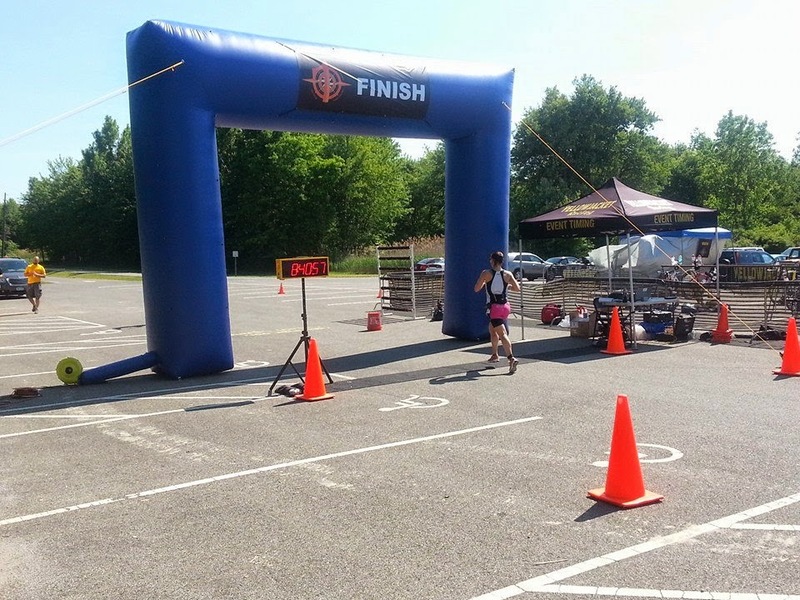 Crossing the finish line of my first 100 mile tri! I was done. I had finished my first triple digit triathlon, my first triple digit anything! I sat down immediately after, which probably wasn't the best idea. And then I walked over to get some food, that I couldn't eat. I drank some Sprite, which I think helped my stomach, and then after finding out about awards I went to change. I had finished in 8 hours 40 minutes and 57 seconds. I had come in 12th out of 14 triathlon participants (one person had DNF'd) and I was 2nd out of 2 female participants overall. Mike had a great race and he finished in 7:27! I am so proud of him! He was 4th overall (amazing!) and had a really strong race until the final 3-4 miles of the run course (he had gotten really bad calf cramps and one of his miles was 16 minutes). I truly can't thank the race directors, volunteers, police officers and other race participants enough. This is an amazing race and I hope that it grows like the Lake Ontario venue has, it is amazing and we will be back! I also can't thank Rob enough, he took the time out of his weekend to come cheer us on and even though I may not have always been smiling when I saw him, I was so happy that he was there. We still would have finished without him being there, but since it was such a small race it was wonderful to have a familiar face out there cheering for us. Mike and I are one step closer to finishing an Ironman! That is seriously awesome. I've never even run that far before let alone at the end of all that other stuff. I'm mighty impressed! Haha I don't know either! Fantastic job, you guys!! :) Proud of you!!! Great job and great race pics! Hope you can apply what you learned to your training and continue to dial in for Louisville. This sounds just hellish. Way to push through and finish in that heat! Is it normal to have such a small field? Congrats! No, not normal. This is still a smaller race (only the 2nd year) but the other location has over 100 participants, which is better. 30 people were registered so some DNS'd and then we think that the winter caused people to be scared about the water temperature. I loved all three of your recaps. Looks hard, but so rewarding. You are amazing. I cannot even imagine working out that long. You are so inspiring. I should just get a temp tattoo made for you to wear at the IM that says,"CRYSTAL THINKS YOU'RE AWESOME!!" because that's pretty much what I always say to you. You are incredible Jamie. For realz. I wish I were half the athlete that you are. Congrats on an awesome race. I'm counting down til Louisville! !